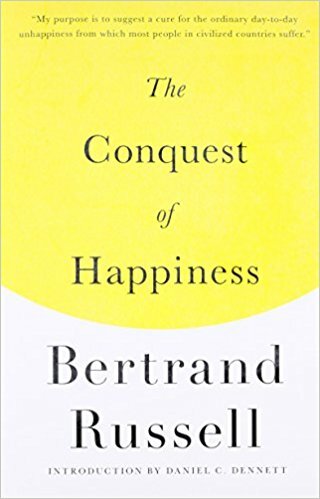 Whether we still suffer in the same ways in 2018 is a matter for debate, but what is true is that ‘The Conquest of Happiness’ still offers some valuable insights and guidance for leading a happy life today. And the first thing to note is that happiness is not something that is going to come easy. I’d like to think the world isn’t going to assail us as much these days, but it is true that life is a series of ups and downs, and you never really know how many of each you’re going to get. Maybe you get more ups than downs, but sitting back and waiting for this to happen is no way to guarantee a happy life. You can probably swing the ups in your favor through effort, of course, and it is also through effort that we might keep a sane and healthy mind even in the face of a down. In fact, Russell believes that even if it were possible to remove all the downs, this would not necessarily be a beneficial accomplishment. We enjoy life more when we earn its pleasures. Putting in work to achieve things drives a sense of purpose that is missing when we get whatever we want. But of course it matters where we direct this effort. Not all paths are equal, not all ends promote happiness or well-being. One area of life in which we expend the most effort is what we might define as ‘work.’ While there are many people that dislike their jobs, work itself can be highly rewarding under the right conditions. “Two chief elements make work interesting: first, the exercise of skill, and second, construction. I have always wondered if talent or enjoyment first drives our interest in something—that is, do we enjoy things because we find that we’re good at them, or do we find we enjoy something and only then work to get better at it? Either way, Russell believes that it is in the growing of our skills that we derive a great deal of happiness, largely irrespective of the behavior it regards. While exercising and improving our skills is necessary, it is also the case that we care about the bigger picture—what is the point in this work? What are we creating or achieving through it? Is it simply an activity to be enjoyed in itself or is there a larger purpose? While many work towards goals such as living good moral lives or improving the world, Russell acknowledges and laments the fact that many people still strive for a definition of success that relies upon money and/or the surpassing of others. This type of mislead motivation poses a risk not only to the happiness we derive from work, but also that of leisure. Competition, Russell argues, is to put oneself at risk of burning out. When our drive for success is held in check, our leisure time is able to be filled with other meaningful activities. Russell believes that we should strive towards as many as possible. Being a jack of all trades helps hedge our bets against the ravages of change. It also means we get to expand our knowledge base into broad domains which themselves are inherently satisfying. Previous Post Can Science Determine Morality?